The Delaware Hayes Grand Pacer Marching Band performs at the Bellbrook Fall Invitational marching band competition on Sept. 15. The band earned second place in Class AAA and best percussion. The band will compete again this weekend at the 18th annual Lebanon Marching Band Invitational in Lebanon. 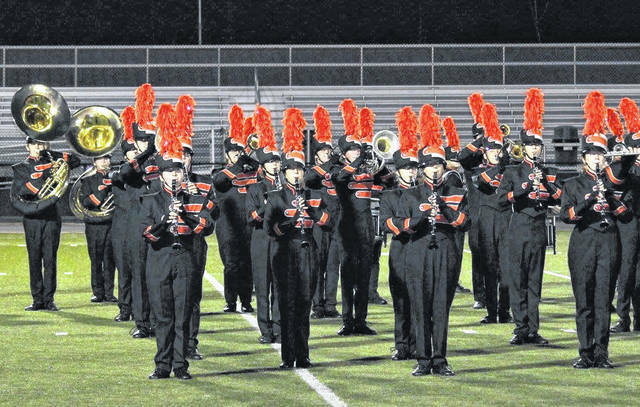 The Delaware Hayes Grand Pacer Marching Band recently journeyed to the Bellbrook Fall Invitational competition and came home with second place in its class and best percussion. This week, during practice ahead of competing in the 18th annual Lebanon Marching Band Invitational on Saturday, the band and percussion section said they are determined to do even better. Lake said the drumline had a goal this year to get a Best Percussion award at a competition, and he was glad the drumline got what it wanted. Caleb Richardson, a senior in drumline who also marches tenor drums, said he was glad they got the best percussion at the first competition of the season because of the effect it will have on the newcomers in drumline. Tom Henson, a junior bass drummer, said the award validated the band’s work over the summer. Henson said he didn’t feel bad about missing first place, because the first-place winner was just a few points ahead of them. Band Director Andy Doherty said he was grateful for the awards and the feedback from the competition judges. Dohtery said the band practices as an ensemble, but it also practices in sections to help each other improve for several hours each day of the week. Evelynn Ream-Monroe, a sophomore who plays tenor saxophone, said her favorite part of the competition wasn’t the awards or recognition; it was seeing the freshman students get into the competition. “They’re so excited,” Ream-Monroe said. The competition was a first for Madison Bricker and Ethan Bush, a trumpet player and bass drummer, respectively. Both joined the band this year. Bricker said she isn’t nervous about Saturday’s Lebanon competition. “I feel like we are going to be the best we can be,” she said. Bush said the awards, particularly best percussion, felt “pretty good,” and they’ve only motivated him more. The band’s performance at Bellbrook can be seen on the Facebook page, Delaware Pacer Bands.